Will ACT for America Provide An Outlet for the 'Alt-Right' Post-Charlottesville? Following the violence in Charlottesville, many are asking where the movement will go from here. With a spate of event cancellations — such as a protest against Google and scheduled appearances by Richard Spencer at two major universities — ACT for America's nation-wide “America First” rallies slated for September 9 may bring the Alt-Right to the streets once again. 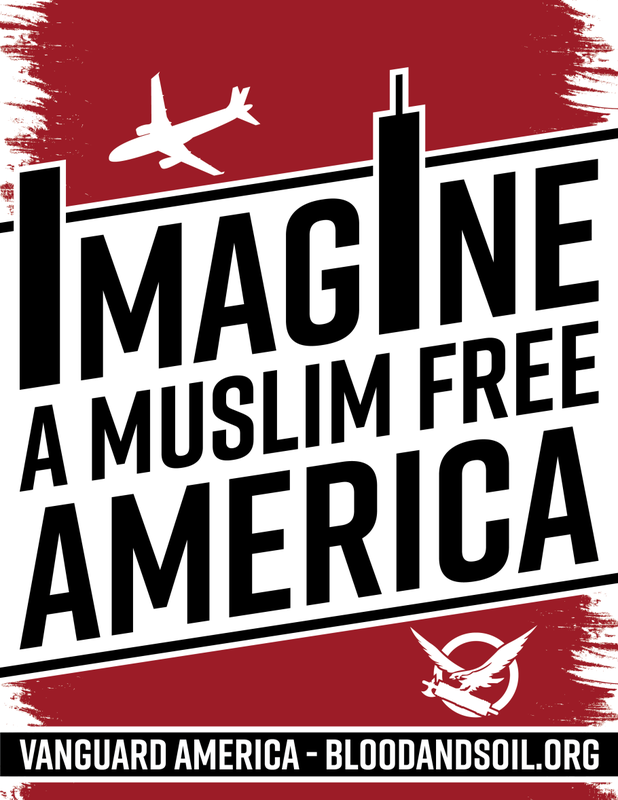 At the New York City march on June 10, Richard Rivera, a Vanguard America spokesperson, attended and spoke to media, telling the Washington Post, “I don’t believe in having Muslims in the United States. 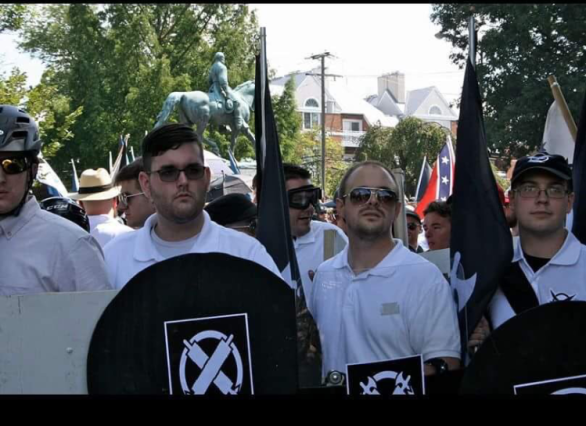 Their culture is incompatible with ours.” James Alex Fields, the alleged driver of the car that killed one and injured 20 when he plowed into counter-protesters in Charlottesville was pictured marching with Vanguard America, donning their attire and holding a shield with the VA logo. Fields with shield second from left. Identity Evropa, which had a heavy presence in Charlottesville, also attended various ACT rallies on June 10. Identity Evropa is lead by Nathan Damigo, a former Marine corporal who discovered his inner white nationalist by reading the work of Holocaust-denying ex-Klansman David Duke while serving five years for armed robbery (while drunk, he put a gun to the head of a cab driver he thought was Iraqi and stole $43). At ACT's Indianapolis March Against Shariah, Identity Evropa’s regional coordinator Jason Richardson spoke. In Orlando, IE members held up a large banner while listening to Holocaust-denier Augustus Sol Invictus and others speak. 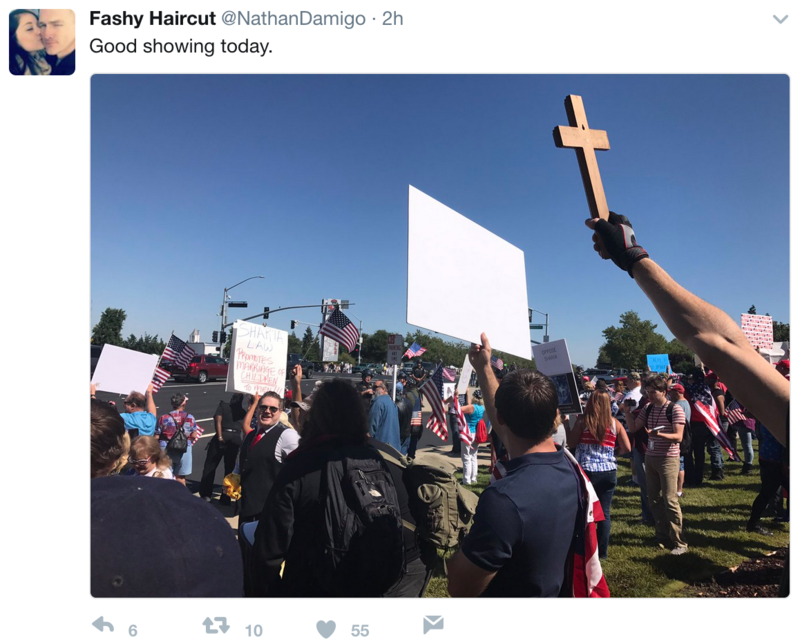 Damigo himself attending the Roseville, California rally. Nathan Damigo, founder of the white nationalist/identitarian group Identity Evropa, at an ACT For America rally in June. What attracts white nationalist groups to ACT is the group’s vehemently anti-Muslim views. While ACT warns about Sharia law replacing the Constitution and how Europe is being overrun by Muslims, the rallying cry for the racists who descended on Charlottesville was, “You will not replace us!” White nationalist Jason Kessler, the organizer of the rally took to Periscope in the week leading up to Charlottesville and stated, “These people are trying to replace us with third-world immigrants, they are trying to replace us with Muslims.” The closed Facebook group used in part to organize the ACT rallies not only contains posts that are sympathetic to Charlottesville, but also plenty of racist material. This is not the first time ACT has attempted to distance itself from white nationalist groups. Billy Roper, a prominent neo-Nazi for decades, had been officially charged with organizing a June ACT rally in Batesville, Arkansas; ACT dropped him after the SPLC exposed his racist past and current beliefs. In March, ACT was forced to fire a prominent chapter leader after remarks about killing Muslims were made public. Considering the common ground between overtly racist groups and ACT for America, there is very little to indicate that Vanguard America, Identity Evropa and other white nationalists won’t flock to the ACT rallies, which will be taking place in over 50 cities across the country. A flyer designed by Vanguard America (VA). VA was responsible for over 40 flyering drops in 2017 featuring flyers like this one. VA appeared at an ACT For America rally in June, along with other racist 'alt-right' groups.